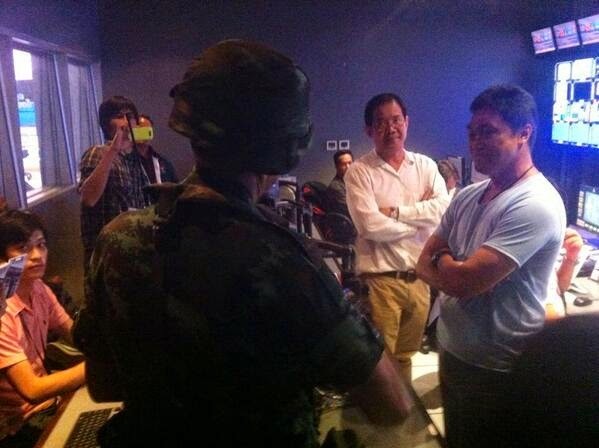 The Thai Media have traditionally worked under both self imposed censorship and very strict lese majeste laws. Crucial to the country’s stability has been the health of the King and what follows. Quite clearly it is going to take time to establish order let alone harmony in the wake of the bitter disputes that have split the country in two and what happens in the weeks to come will decide the country’s future. The French Revolution spawned the French Republic. A popular ‘democratic’ movement in the 30’s against the established order spawned Nazi Germany. 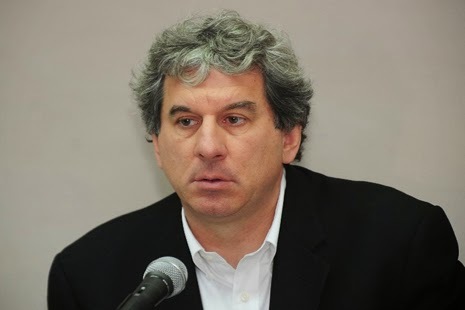 What is sure, as German journalist Nick Nostitz, who has been singled out by anti-government forces as a hate figure, has pointed out, is there can be little logical local argument. You are either on one side or the other. When separated each side can put up a logical reasoned argument. When in confrontation reason flies in the wind. What is happening today is considered by many to be the pragmatic local solution to avoid what could have become a bloodbath. Nevertheless it is clearly unpalatable to many foreign governments and human rights organisations, the US has cut military aid and protest is growing. On the other hand this is a problem only Thais can sort out. 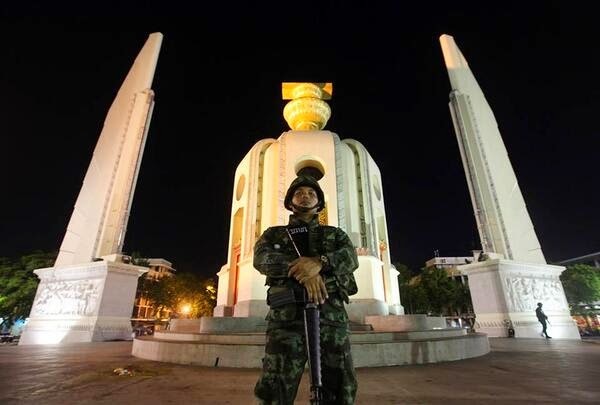 (New York, May 24, 2014) – The Thai military should immediately revoke abusive martial law powers, end censorship, and release all people who have been arbitrarily detained, Human Rights Watch said today. The military should urgently restore democratic, civilian rule. Since the military coup was announced on May 22, 2014, the National Peace and Order Maintaining Council (NPOMC), comprised of all branches of armed forces and the police, has arrested more than 100 ruling party and opposition politicians, activists, journalists, and others accused of supporting the deposed government, Human Rights Watch said. While some have been released, the army has also ordered some 155 others to report, including deposed acting Prime Minister Niwattumrong Boonsongpaisan. Those summoned by the military face arrest and prosecution if they fail to report, and are prohibited from leaving Thailand. The military has also imposed widespread censorship and other broad restrictions on broadcast, print, and electronic media across the country. The NPOMC has imposed a curfew from 10 p.m. to 5 a.m. and banned public gatherings of more than five people. Military authorities ordered rallies of both the pro-government United Front for Democracy against Dictatorship (UDD) and the anti-government People’s Democratic Reform Committee (PDRC) to disband. The military began arresting people on May 20, after the imposition of martial law nationwide. According to the army spokesman Col. Werachon Sukhondhadhpatipak, more than 100 people have been arrested, including former Prime Minister Yingluck Shinawatra and other politicians, leaders of political movements, and financiers of the ruling Pheu Thai Party in order to “keep them away from the situation.” The spokesman said that Yingluck would be held for two to three days because, “She is one of people involved in the conflict.” A number of Pheu Thai Party leaders reportedly remain in military custody. Immediately following the coup, military authorities in Bangkok and across Thailand summoned officials from government agencies, professional associations, and civil society groups to report to the military, where they are being instructed not to defy regulations issued under martial law. Soldiers have dismantled UDD and PDRC rally sites and sent protesters back home by bus. Several people protesting against military rule in downtown Bangkok, including Thanaphol Eiwsakul, the well-known editor of Fah Diew Kan magazine, were arrested by soldiers on the evening of May 23. The whereabouts of those arrested remain unknown. Reports that the military is detaining people in unofficial places of detention, such as military camps, raise grave concerns, Human Rights Watch said. There are unconfirmed reports that some UDD leaders and supporters last seen being arrested by soldiers at the Aksa Road rally site outside Bangkok have gone missing. UDD leaders and supporters in other provinces have also reportedly been detained in undisclosed military camps without access to their families and lawyers. Among those detained incommunicado in secret locations are Boonlert Ruengtim, a core leader of the UDD’s militia who was arrested on May 20, and Chantana Warakornsakulkij and Chawawat Thongpuak, who were arrested on May 21 following raids on alleged UDD weapons caches. The military authorities have thus far provided no information about the names and number of detained or their current whereabouts. The risk of torture and ill-treatment significantly increases when detainees are held incommunicado in unofficial locations and under the control of the military, which lacks training and experience in law enforcement. Censorship and other restrictions on media and free expression that began after the coup have intensified, Human Rights Watch said. Tantiwittayapitak, and held him for several hours after his station defied the order by broadcasting its regular programs through Internet feeds. Even though those TV stations are now allowed to resume their regular programs, they have to strictly follow the junta’s order not to air any information critical of the military intervention. 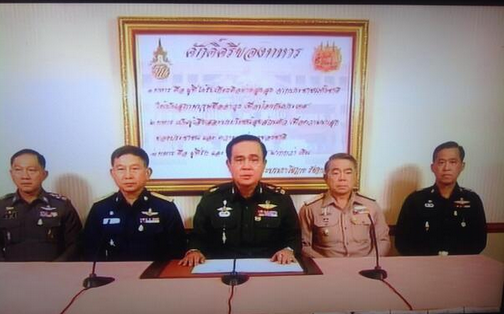 The military has directed print media not to publicize commentaries critical of the military’s actions. TV and radio programs have been instructed not to invite on their programs anyone who might make negative comments about the military or the political situation in the country. Military authorities have told journalists that failure to comply will lead to prosecution. The NPOMC has invoked censorship against information it considers to be “distorted” or likely to cause “public misunderstanding” in broadcasts, printed publications, on social media, and on websites. At the time of writing, the military has forced off the air 15 satellite and digital TV channels, as well as many community radio networks. Cable and satellite operators were ordered to disconnect their TV links for all international news and entertainment channels, resulting in the nationwide blocking of international stations such as CNN, BBC, Al-Jazeera, and Bloomberg. Soldiers have been placed in newsrooms to censor “negative” reports and comments. On May 23, the military summoned all Internet service providers and ordered them to strictly self-censor content related to the country’s political situation. When army commander-in-chief Gen. Prayuth Chan-ocha announced the coup on May 22, the military suspended most of the 2007 constitution and took over national administration from the government. Prayuth invoked the century-old Martial Law Act of 1914, which grants the military virtually unlimited powers to restrict fundamental human rights and freedoms and provides effective immunity for abuses committed. Under the act, all civilian officials must act in strict compliance with the requirements of the military authority. Furthermore, all the provisions of any law, including human rights safeguards, that are inconsistent with martial law are suspended and replaced by martial law provisions. Under the Martial Law Act, the military, without judicial oversight, can prohibit any activity, censor the media at will, outlaw meetings and assemblies, search and seize any item, occupy areas, and detain people without charge for up to seven days. There is no effective redress for harms caused since the law bars remedy or compensation to individuals or companies for any damage caused by military actions done in line with martial law authority. Prayuth said the nationwide intervention will continue “as long as necessary.” He claimed the intervention was needed to prevent imminent riots and widespread disturbances arising from increasingly violent political confrontations between anti-government protesters and government supporters. The power seizure took place immediately after the military brokered negotiations among representatives of rival factions – including the caretaker government, the ruling Pheu Thai Party, the opposition Democrat Party, the pro-government United Front for Democracy against Dictatorship, and the anti-government People’s Democratic Reform Committee. The negotiations failed when the caretaker government was unwilling to resign. The apparent target of the coup is former Prime Minister Thaksin Shinawatra, who was ousted in a 2006 coup, and his political allies in the ruling Pheu Thai Party, Human Rights Watch said. 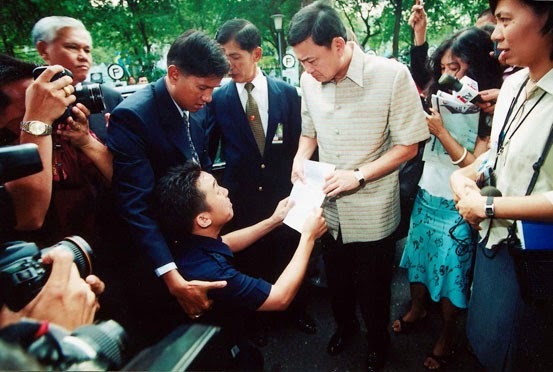 Thaksin, a populist leader with a poor human rights record as prime minister from 2001-2006, has been in exile since 2008, evading a corruption conviction, and has continued to finance and oversee the Pheu Thai Party, installing his sister, Yingluck, as prime minister after the Pheu Thai Party won the last national election in 2011. Where was Human Rights Watch when Thaksin ordered the extra-judicial killings of thousands of Thais during his risible but deadly campaign to 'rid Thailand of all drugs in 3 months'? Where were they when 80 or so unarmed men were suffocated to death in the South? A catchy statement and a good soundbite at the end. I'm all for ballots not bullets, jaw jaw not war war. But ballots haven't worked. Both parties are really right wing autocratic parties, giving th eoccasional sop to the voters. If they can't win they boycott or disrupt. The Thais can't keep talking about the dysfunctionality, the country must move on. Was there a better way? Most Thais think not.